Dahua Technology has developed a new generation of thermal imaging devices with functions that balance visible light with infrared, enabling users to effectively monitor an area under all lighting conditions. In addition, these functions include advanced capabilities such as intelligent temperature measurement and behaviour analysis, further extending the scope of surveillance applications, such as perimeter protection or predictive maintenance in substations. The company’s new products adopt advanced uncooled infrared detectors with 400 x 300 effective pixels, realising a 40% increase over the previous infrared detector. The benefit is that the field of view is increased. 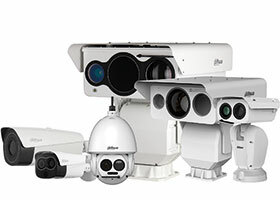 The Dahua IVS (Intelligent Video System) has built-in video analytics that deliver intelligent functions to monitor a scene for tripwire violations, intrusion detection and abandoned or missing objects. It requires a certain number of pixels on the target to function properly. The DH-TPC-BF5400-B13 model can be used for perimeter intruder detection, acting as an invisible wall. When installed at the recommended height of 5 metres, one camera can cover 100 m. Whether it is day or night, as long as someone enters into a targeted area, a warning will be sent to the control centre. A thermal camera is not just for video surveillance, it is also suitable for remote temperature monitoring to prevent accidents. Calculating the corresponding relationship between received radiation energy and temperature, it shows the surface temperature of the target through different grey values. It provides users with real-time information about substation equipment much more efficiently, saving time and labour. If the temperature of equipment or part of the station exceeds a pre-set threshold, the system will automatically trigger an alarm and alert management.